The first 360 degree LED lantern brings new technology to a classic. No reflectors are required to pour an even beam of light on camp with no dead, black spots. 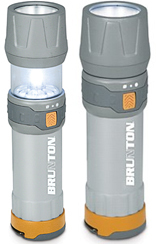 Not only is the LED unique, this lantern runs for hours off of D, C, AA or AAA batteries whichever you have handy. It's called Omnivore Variable Battery Technology, a patent-pending design exclusive to Brunton. Push the head in to use as a flashlight, pull it out for a lantern. Weight: 6.6 oz (2 AA Batteries). Run time: Up to 32 hours (D-cell).